This is an example of a SWOT analysis for a Retail Business, whilst every effort has been made to ensure our examples are accurate, their accuracy depends on where you live in the world and what has changed since they were developed. You may use our SWOT examples as a guide to indicate what your SWOT might look like but please do not build a plan based on these examples without validating their accuracy for your business in your region of the world. The first of our SWOT analysis examples is for a retail business, the business was established by a entrepreneur stocks brand name clothing imported from manufacturers around the world. The business currently only stocks 3 brands of men’s clothing, pitched at the 18 to 28 single young adult. Assets are really only shop fittings and stock with two computers and software. Do you have long-term rental contracts for your business locations? 3 + 3 + 3 year lease in major shopping center, location within the shop is at the will of the center, poor sales will result in a shift to a low foot traffic location. Are your products unique or market leading? No, stock is the same as our competitors. We can pick and choose what styles to stock. Have you got sufficient financial resources to fund any changes you would like to make? No, we do trade profitably, but are not able to fund an expansion to a larger footprint store. Do you have any cost advantages over your competitors? No, rents are all pretty standard, you can save on rent but loose the foot traffic, so it is all relative. Do you use superior technology in your business? Is your business high volume? Can your scale up your volume if you need to? Not really, orders are placed in advance, shop size is restrictive. Yes, though the brand space is becoming cluttered with more and more recognizable brands. Depleting the value of any one brand. Your reputation - are you considered a market leader? or an expert in your filed? Yes, we have a good connection with our customers, our email list grows and many customers advise they were referred to us by their mates. We get a lot of repeat customers. Yes, though we are just another supplier to them. We are able to differentiate from our competitors. We have long term agreements in place with some suppliers to be their sole representative in this region. Do you have any unique alliances with other businesses? No, maybe our territory agreements with some suppliers. Do you own any patents or proprietary technology? Do you have a proven advertising process that works well? Email news letter with specials and new stock, seems to work for retaining customers. Most new customers were attracted to the shopping complex. Do you have more experience in your field? Are you managers highly experienced? Do you have superior industry knowledge? No, though we do have a good set of sales skills, particularly up selling and forming relationships. People feel good coming by and seeing us. Are you involved with industry associations? No, only in sales and relationship building. Is your plant and equipment old or outdated? Is your product line too narrow? Maybe, we only sell a few of brands of men clothing, we could stock more accessories, but we don’t want to confuse the customer about what line of business we are in. Have you got insufficient financial resources to fund any changes you would like to make? Do you have a high overall unit cost relative to your competitors? Do you use inferior technology in your business? Do you have low volume and are restricted in your ability to scale up? Do you have a weak or unrecognizable brand? Do you have a weak or unrecognizable image? Do you have a poor or impersonal relationship with your customers? Do you have a poor relationship with your suppliers? Do you have a poor relationship with your employees? Is your marketing failing to meet objectives? Do you have low R&D? Do you lack industry knowledge? Do you lack innovative skills? Can you expand your product range? Can you diversify your business interests? Can you expand into your customer's field? Can you expand into your supplier's field? Do you have placid competitors? Do you have any export opportunities? Will the total market for your products grow? Will there be any changes to any import/export constraints that will be favorable for your business? No, almost all clothing is imported there is little domestic production and a lack of ability for domestic producers to scale up. Any changes will impact all retail outlets equally. Is the economic outlook favorable? No, however this may play favorably to our business as our target market might postpone larger expenses as a result a greater share of purse may be allocated to clothing – this is yet to be proven. Are there any favorable cultural shifts that will benefit you? Due to increases in housing prices our target customer has opted to postpone taking on longer term debit. Instead to remain in the “nest” for longer. This trend increases their customer life for our products. Are there any changes in the use of technology that your business can utilize such as Ecommerce or Internet sales? Use of internet to increase marketing and online sales. Will low cost imports impact your business? No, our shop appeals to the middle income bracket who are not interested in low cost alternatives. Though high quality low cost imports will increase our margin. Do consumers have a choice to use a substitute product? Are substitute product sales increasing? Is your market in slow growth or in decline? Is the power of your customers or suppliers growing, can they dictate price? Are the needs of your buyers changing? Yes, every season fashion changes, however the need for medium quality products remains unchanged. Will foreign exchange rate changes affect your imports or exports? Maybe an increase in awareness about the behavior of governments of low cost producing nations may eventually impact our supply chain. Is regulation in your industry increasing? Our rental contract allows the center to move our business location, if they believe another business will make them more profits. 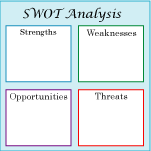 We hope that you found our SWOT analysis examples useful. 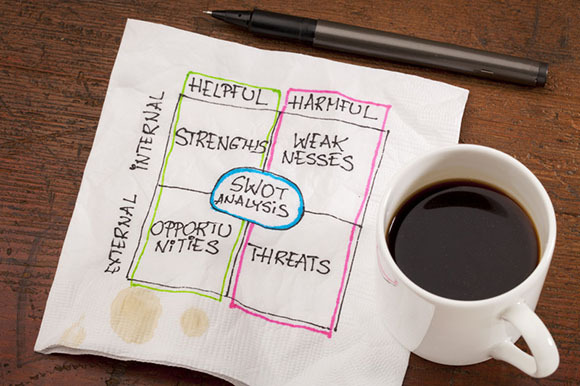 You may not have seen all of our SWOT Analysis examples, in which case why not take five minutes to click through and review them now?